Government-run childcare was crucial in enabling women’s employment during World War II, but today the program has largely been forgotten. Outfitted in dark blue uniforms, their heads wrapped in polka-dotted red bandanas, more than 2,000 people recently broke the Guinness World Record for the largest gathering of people dressed up as Rosie the Riveter. These record-breakers embodied the iconic depiction of Rosie: the fierce-eyed, muscular worker ready to contribute to the war effort. But there is a less familiar image that circulated during World War II, in which Rosie, along with her rivet gun, carried a wailing child on her back. This image prompts a question the more familiar one doesn’t draw attention to: What happened to the children of all those real-life Rosies? After all, as the author G.G. Wetherill put it in 1943, “The hand that holds the pneumatic riveter cannot rock the cradle at the same time.” Fathers were conscripted abroad or in the labor market, and, besides, the cultural mores of the time didn’t hold men responsible for caregiving. So if mothers were toiling in the workplace to keep the domestic economy going, they couldn’t also be at home caring for their children. With this tension in mind, someone stepped up to care for the hundreds of thousands of children in need: Uncle Sam. 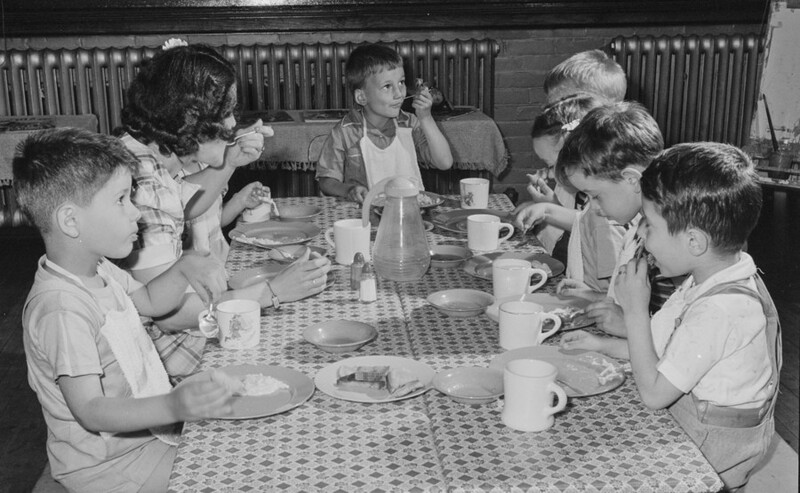 During World War II the United States government operated a far-reaching, heavily-subsidized childcare program—the likes of which Americans haven’t seen in the seven decades since. But the situation wasn’t exactly enviable for the Rosies. Particularly in the early part of the war, public figures sought to restore women to their purported rightful role of caring for their kids in the home. They often received similar messages from loved ones: A 1943 Gallup poll found that only 30 percent of husbands unconditionally supported their wives’ employment during the war. Once women returned from their long days at the factory, they would still be expected to do all the housework. And after getting paid about half the wage of their male colleagues, women were unceremoniously ejected from the workforce upon men’s return from the war. This is to say nothing of disparities among women themselves: Before white, middle-class women dutifully entered wartime munitions factories, many minority women had long been toiling outside of their homes, and poor women had no choice but to take up jobs. All that said, the Lanham program is of landmark importance. Historically, the U.S. government has supported childcare primarily to either promote poor children’s early education or push poor women into the labor force. The Lanham program, though, broke ground as the first and, to date, only time in American history when parents could send their children to federally-subsidized childcare, regardless of income. And it was affordable: By late 1944, a mother could send a child of two to five years of age to childcare for 50 cents per day (about $7 in today’s money, adjusting for inflation). That included lunch, and snacks in the morning and afternoon. Even though quality varied at the Lanham-funded centers and bureaucrats in charge of the program occasionally stepped on each others’ toes, the program, with such a broad base of beneficiaries, changed public sentiment about child-rearing. Until then, daycare had been considered a pitiful provision for poor mothers. Having served families across the socioeconomic spectrum, the centers familiarized the public with sending young children away from the home for part of the day. In fact, the journalism professor Rose Kundanis observes that it was during the Lanham programs’ tenure that the term “day care” was coined. The programs stand out historically for another reason: They addressed the needs of both children and mothers. It wasn’t low-quality custodial care meant to serve as a holding pen for children while their parent worked, nor was it a program that sought to educate children without regard to mothers’ working schedules. As Sonya Michel chronicles in Children’s Interests/Mothers’ Rights, over the last two centuries, one barrier to the establishment of high-quality national childcare has been a battle between those advocating for the interests of children and those advocating for the rights of mothers. The Lanham programs managed to reconcile these rival needs. The Arizona State University professor Chris M. Herbst’s recent study of the long-term effects of World War II-era childcare found a substantial increase in maternal employment, even five years after the end of the program, and “strong and persistent positive effects on well-being” for children. But government support for childcare was meant to be temporary, and it was—even if women weren’t ready to surrender their jobs or their publicly provided daycare. In the early postwar years, working mothers, social-welfare groups, unions and civic organizations, early-childhood educators, and social workers all fought to retain the service. In response, President Truman requested additional funds to extend the program for a few more years, but efforts to extend federally-administered childcare on a long-term basis failed. At the end of the war, the Lanham nursery schools closed, helping cast women out of the workforce to open up jobs for returning soldiers. The new national consensus dictated that children be cared for in the home, not dropped off at daycare. This belief stuck even as women’s employment resumed its upward climb after the war, though it had some prominent opponents. “The closing of childcare centers throughout the country certainly is bringing to light the fact that these centers were a real need,” Eleanor Roosevelt wrote in a newspaper column a month after the war ended. “Many thought they were purely a war emergency measure. A few of us had an inkling that perhaps they were a need which was constantly with us, but one that we had neglected to face in the past.” America never did get around to replacing the Lanham centers, though it got remarkably close in 1971, when Congress passed the Comprehensive Child Development Act, only to have it vetoed by President Nixon. Even though it disappeared, the Lanham program demonstrates what happens when childcare is viewed as a collective responsibility. More than a half-century later, 64 percent of women with children under the age of six are in the workforce, yet America’s work-family policies don’t even come close to those that existed near the end World War II, when only about 10 percent of mothers with children of those ages were working. Now, in 31 states and the District of Columbia, the average annual cost to send an infant to daycare can exceed a year’s tuition and fees at a public university. High childcare costs do not merely strain parents’ budgets; they often pressure women to drop out of the workforce, because in many cases the price of childcare would surpass earnings from a job. A lack of affordable childcare has contributed to the yawning long-term earnings gap between women and men. The image of Rosie with a child strapped to her back is a reminder that, though there are good reasons to applaud the women who changed norms by working in munitions factories, advocates shouldn’t focus myopically on championing women’s employment. To do so would be to ignore the things—such as high-quality, affordable childcare—that make it feasible for mothers to participate in the labor force. Today, women are still expected to forget about or scale down their careers if no decent childcare options are available. There are signs that a Lanham-like perspective is returning today. Slowly, conversation is turning away from the individualistic question of whether women can “have it all” (a query never directed at men) toward an acknowledgment that the absence of policies such as universal childcare have constrained women’s ability to hold down employment and have children—especially in a labor system that demands long working hours, dictates high childcare fees, and pays men and women unequally. What has long been treated as a private concern for mothers is now being recognized as a matter of national policy. Public intellectuals, Nobel economists, and Democratic presidential candidates have all declared their support for affordable, high-quality childcare. It’s hardly encouraging that it took a world war for the U.S. government to establish the nation’s only universal childcare program. Still, if it, and other policies like it, seem unattainable today, consider what Rosie herself would say: We can do it.